Recipe from Ana Fernandez, Manager, Customer Specific Marketing, Kellogg Company. 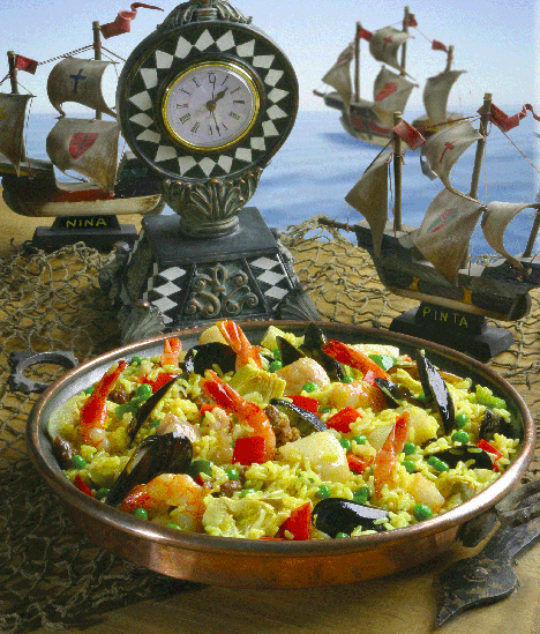 Celebrate Columbus Day and set sail for a new world of healthy eating with this Spanish paella recipe. Mix in seafood, sausage and your favorite vegetables for a real treat. Queen Isabella knew when the time was right and so will you! 1 pound seafood * (choose from firm, mild fish cut into 1"–2" pieces; medium-size shrimp, peeled; scallops; crabmeat; mussels or small clams, de-bearded and scrubbed clean). *Seafood listed is a suggestion, but use whatever you like and is available. Experiment with different combinations for fun. However, DO NOT use oysters. Their unique taste clashes with the others. Sauté the sausage until cooked, if not already cooked. Remove the sausage, crumble and set aside. Sauté the onions, red pepper and garlic in the olive oil, until soft. Stir in the paprika, saffron liquid, salt and pepper. In 1" of water, steam clams and mussels until just opened, discard any clams or mussels that do not open. Remove with a slotted spoon. Combine the remaining water, the clam juice and enough water to make 4 cups of liquid. Bring to a boil. Add the tomatoes to the peppers, and sauté until hot. Stir in the uncooked rice and sauté 3-5 minutes. Add the hot clam juice and mix well. Cook over moderate heat, uncovered, for 5 minutes without stirring. Stir in the sausage and firm seafood. Pat the ingredients into a flat, even, but still loose surface. Arrange the shrimp, scallops and artichokes. Press into the rice. Bake uncovered for 15 minutes, or until shrimp/scallops are just cooked. Arrange the clams and mussels, open side up, into the rice. Sprinkle the peas over the top. Bake for 5 more minutes.